Pedro Mairal burst into the literary scene when Una noche con Sabrina Love won the first edition of the Premio Clarín de Novela in 1998. After a blitz of exposure, he retreated to his natural media-shy self and released books of poetry and a collection of short stories, Hoy temprano. In 2005 his second novel, El año del desierto, offered a stark reading of a country wrecked by a crisis that turned back history’s clock and devolved it to the primeval desert it had emerged from originally. The nature of Salvatierra’s work, too, is telling: a running portrait of life, an endless scroll in which events are interpreted, transformed, fused, remembered and purged. Salvatierra painted every day of his adult life, between his work in a post office and returning home to his family. The result are huge scrolls of painting, one for every year of his life, about four kilometers of seamless images. His art is an extension of life rather than its raison d’etre – another deviation from the figure of the artist as modern icon. The other main focus of the book is an exploration of the father-son relationship. Salvatierra’s sons embark on a quest to preserve his work and find a missing scroll of painting after his death. This search provides the plot for the book, a slender backbone for the internal processes and observations of its morose development. Many years later, an adult son finds his father through the painting and discovers that “you fill the spaces parents leave blank” – more than the secrets revealed by the missing portion of the painting, the quest reveals a flawless, circular, flowing stream of life that runs across personal biographies, across artistic expression and across generations. An unusual choice of themes by an unusual writer, both ambitious and understated. The prose is carefully constructed but the care put into it works towards effortlessness and invisibility: deceitfully simple, classical yet modern, smart but not too clever. The style glows and sometimes shines but never glitters; particular passages stand out, but the effect (as in Salvatierra’s painting) is not in the quotable sections but in the wholeness of the text. Here, Mairal is bridging the poet and the narrator: observation, detail, remembrance and thought are the driving forces. The other driving force is unveiling. Just as Salvatierra’s scrolls can be seen in small parts only, the story bubbles below the surface, just outside of the reader and the narrator’s reach – much is left unsaid or unknown, much is hinted at, much is guessed but not confirmed. This depth creates a murky atmosphere, yet another way in which the story mimics the river that is present as place, image and metaphor throughout the book. Una noche con Sabrina Love was an auspicious debut, but this book finds Mairal more mature in every sense of the word. The youth-turned-adult road-movie feel of Sabrina Love is transformed here into contemplation, many things happening while not much is going on. The balance is just right, the tone is precise, the narration is tight, the characters are fully fleshed. 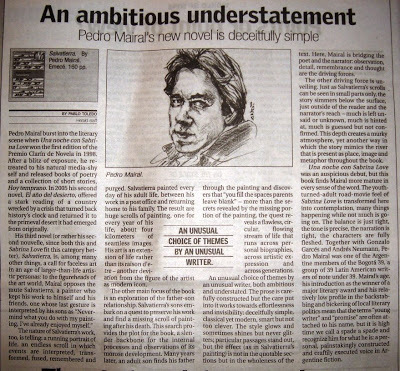 Together with Gonzalo Garcés and Andrés Neumann, Pedro Mairal was one of the Argentine members of the Bogotá 39, a group of 39 Latin American writers of note under 39. Mairal’s age, his introduction as the winner of a major literary award and his relatively low profile in the backstabbing and bickering of local literary politics mean that the terms “young writer” and “promise” are often attached to his name, but it is high time we call a spade a spade and recognize him for what he is: a personal, painstakingly constructed and craftily executed voice in Argentine fiction.